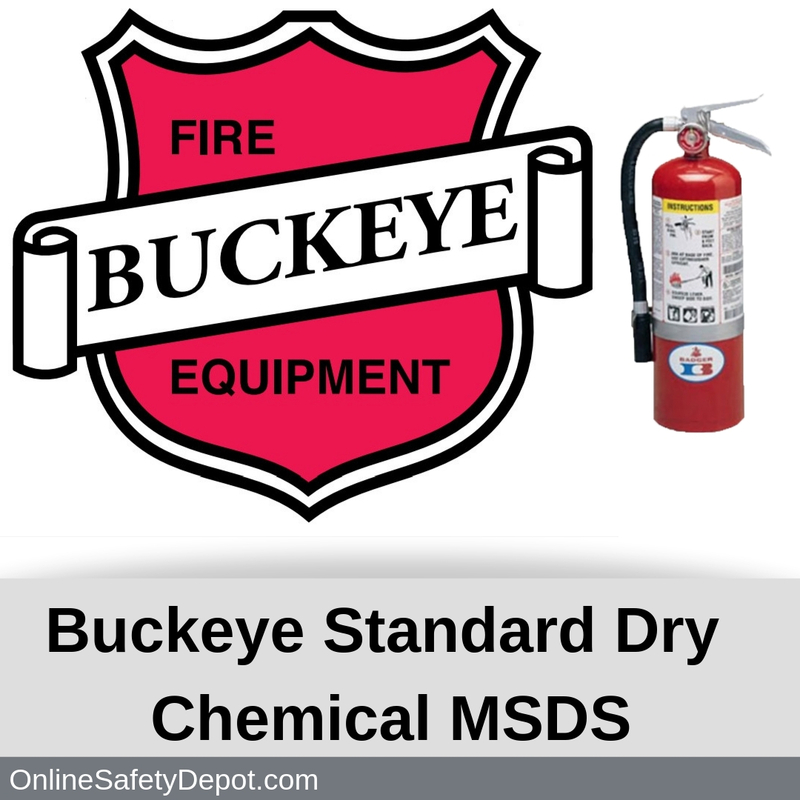 Buckeye Fire manufactures a line of Standard Dry Chemical fire extinguishers that are designed to fight class B, and C fires using a sodium bicarbonate-based agent. The Standard Dry Chemical fire extinguisher is a popular fire extinguisher for many businesses where flammable liquids or energized electrical equipment fires may occur. This section simply lists what the product is called (Standard Dry Chemical Fire extinguishant) along with the contact information for Buckeye Fire. This section explains how to identify the adverse health effects and symptoms of Standard Dry Chemical Fire Extinguishant. Buckeye’s Standard Dry Chemical can affect the eyes, skin, and respiratory system. Symptoms of external exposure and adverse reactions include difficulty breathing, coughing, eye, lung and skin irritation. When ingested, the chemical can cause gastric irritation, nausea, and diarrhea. This section also lists the various chemicals and their classifications. This section explains how to treat chemical exposure to the eyes and skin as well as how to treat someone who has inhaled or ingested the chemical. It also identifies existing medical conditions that can be aggravated by exposure to the Standard dry chemical extinguishing agent. This section reviews the firefighting capability and potential reactions to fire for the Buckeye Standard Dry Chemical agent. This section describes handling the fire extinguisher and the agent to limit exposure while it’s not in use, including preserving the extinguisher to prevent loss of integrity prior to being used in the event of a fire. This section explains the respiratory hazards of exhaust gases and incomplete combustion that exist during the use of the extinguisher and the recommended respiratory, eye, and skin protective measures to limit exposure. Including OSHA’s PEL and ACGIH TLV guidelines. This section identifies the physical and chemical properties of buckeyes Standard Dry Chemical Agent. Including is appearance as a “white fine powder that is odorless”. This section lists the degree of stability, the byproducts of decomposition, and any hazardous reactions. This section presents the known exposure effects to human target organs and tissues due to “acute toxicity”, “chronic toxicity”, and any “reproductive toxicity”. This section identifies any effects that agent, “sodium bicarbonate-based” has on the ecosystem toxicity, its degradability, bioaccumulation, and soil mobility with groundwater. This section identifies that the Standard dry chemical agent is not defined as a hazardous material in the US (DOT) or Canada (TC), but that when transported in a stored pressure fire extinguisher the extinguisher itself is considered a hazardous material and shipping requirements are listed. This section declares “other information” that may be pertinent related to the specific product including but not limited to regulatory information from for other countries as well as any qualifying statements.